If your order weighs less than 13 ounces, save huge on shipping with USPS first class (with tracking number). This product weighs 3.9 oz. 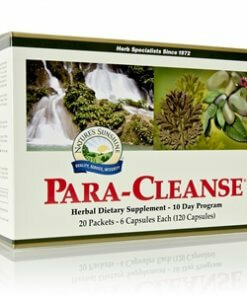 Nature’s Sunshine Para-Cleanse provides support for the natural cleansing processes of the intestinal system. This 10-day program includes 1 Paw Paw Cell-Reg™ capsule, 2 Herbal Pumpkin Combination Capsules, 1 Black Walnut ATC Concentrate capsule, and 2 Artemisia Combination capsules. 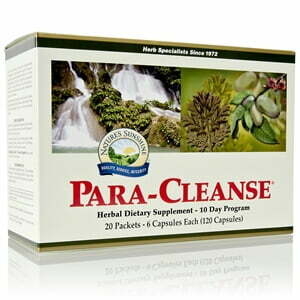 Para-Cleans is designed to encourage the health of the intestinal environment. NOTE: Pregnant or nursing women or any person taking a medication or with a medical condition should consult with their health care provider before using this product. Use as recommended. Only intended for 10 days, not prolonged use. If diarrhea, loose stools, or abdominal pain develop or are present, discontinue use. This product may worsen these conditions and harm health. Chronic diarrhea can result in serious illness. Instructions: Take 2 packets each day, one 15 minutes before breakfast and one 15 minutes before dinner. Drink at least 8 oz. of pure water with the capsules. Continue the program for 10 days.